You’ve probably heard the low frequency beat that occurs when two closely spaced carriers are present, like in this recording. The two bright greenish lines are the carriers, one at about 1620.0076 kHz and the other around 1620.0095 kHz (and wandering around). 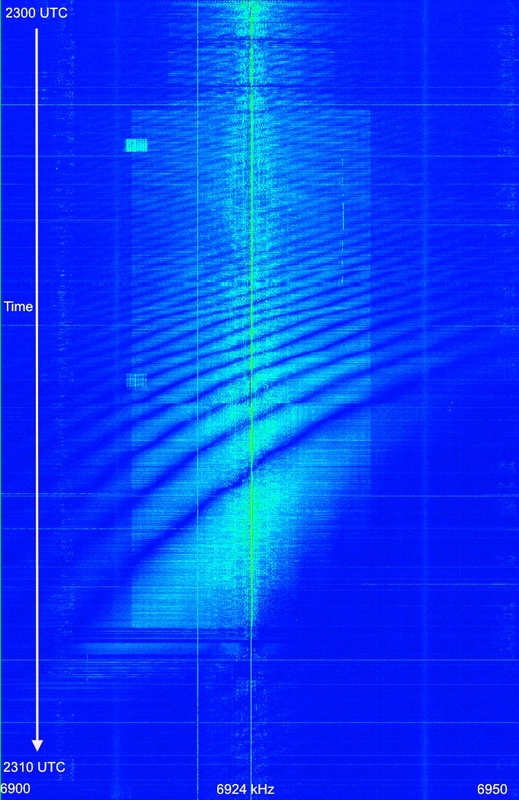 The result of the two carriers mixing is the difference frequency, 1620.0095-1620.0076=0.0019 kHz or 1.9 Hz. The higher and wandering carrier is the local college station (it’s actually about 12 miles away), the other station is probably WDND from South Bend, IN. In case you’re wondering, the netSDR settings were a 200 kHz bandwidth (250 kHz output rate), and a 2,097,152 FFT with a resolution of 0.12 Hz. A fairly active pirate station the past week or so has been the “Fruitcake” station, which plays songs and sound clips related to, well, fruitcake. Hence the name. On December 20, 2011 at 2300 UTC I recorded a transmission of this station with my netSDR. What I ended up capturing was a very interesting and educational example of a station going long. An S9 signal is -73 dBm, right about the received signal level at the beginning of the broadcast. There is some fading up and down, typical with shortwave radio. What’s interesting is that the change in signal strength seems to have a definite period, rising and falling every few seconds. After a few minutes, the period starts to become longer, and the amplitude of the variation also increases. About half way through the transmission, the amplitude becomes quite large. There is then one deep fade, one large increase in signal strength, and then the signal almost fades out, going down to about -95 dBm (about S4). Notice that 10 minutes ago it was S9. A waterfall is a color coded representation of the signal strength of a band of frequencies over time. In this case, it shows us the signal strength from about 2300 to 2310 UTC, over a frequency range of 6900 to 6950 kHz. The blue background represents the weak background noise that is always present, in this case about -97 dBm. The brighter colors towards green represent stronger signals. 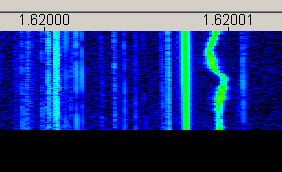 We can see the station’s carrier at 6924 kHz, and the sidebands containing the audio modulation (this is an AM signal). The change in bandwidth of the received signal about a minute and a half into the transmission is due to the audio that was transmitted, one song ended, and another sound clip, with wider audio, began. 1. The short choppy fades at the beginning of the transmission are evident. 2. As time goes on, the fades become more prominent, and we can see the increase in their period. 3. We can see the background noise levels increasing in amplitude. Look just outside the passband of the station itself, and you can see waves of increasing and decreasing background noise. 4. The fades all start at a higher frequency, and drift down to lower frequencies over time. This is a type of phenomena called selective fading, which you may have read about. So, what is the cause of the selective fading? There are several possibilities. One is when both ground wave and sky wave signals are being received. If there are phase differences between the two signals, they cancel out, reducing the received signal strength. Likewise, if they are in phase, they support each other, and add together, increasing the signal strength. One common example of this is with medium wave (AM broadcast) stations. When you are close to the station, the ground wave signal is extremely strong, and the sky wave is relatively weak, resulting in excellent reception with no fading. At a long distance away from the station, the ground wave is extremely weak or nonexistent, resulting in only a sky wave. 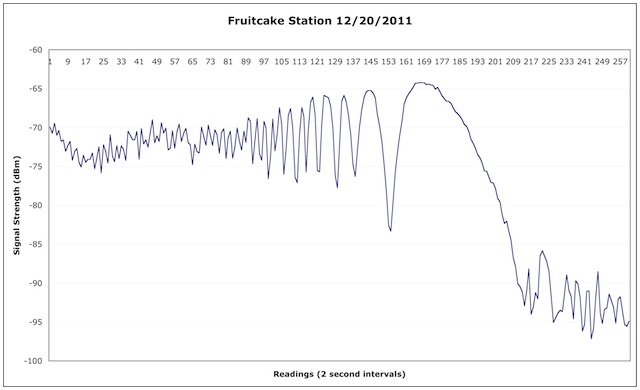 Reception is weaker than the first example, but often reliable for stronger stations. This is why you can pick up AM stations over long distances at night. However, if you are at an intermediate distance, you can receive both the sky wave and ground wave. As the relative phase between them changes, you get fades. I’ve noticed this with a semi-local AM station. It has excellent reception in the daytime, but once evening approaches, reception gets very choppy. This is even before other stations begin to roll in. Next up, and the idea I am presently sold on, is propagation via both the F1 and F2 layers. During the daytime, when ionization is strongest, the F layer splits into two layers, the F1 at about 150-220 km and the F2 at 220-800 km. At night, the F1 layer merges with the F2 layer. Perhaps, during the daytime, only one layer is responsible for NVIS propagation. My thought is that the F1 layer is providing the propagation, as it is the lower layer, and the first one the radio waves would interact with. Then, in the evening, when the band is going long and the F1 layer starts to dissipate allowing some radio waves to reach the F2 layer, propagation is occurring via both layers. Relative phase differences between the signals propagated by each layer cause the selective fading effects. Once the F1 layer completely dissipates, only the F2 layer is left, but it is unable to support NVIS propagation at 7 MHz. Recently shortwave free radio station Channel Z Radio conducted test broadcasts using three different transmitters, all on the same frequency with the same antenna, a half-wave horizontal dipole cut for 6925 kHz, mounted about 40 feet high. As described in a recent article, this setup should be ideal for NVIS or regional operation. These recordings were made with a netSDR receiver, and a 635 ft sky loop antenna. The I/Q data was recorded to disk, and later demodulated with my own SDR software, which is based on the cuteSDR code. If you hear any glitches in the audio, that’s my fault, the code is still under development. In all cases, I used a 4 kHz wide filter on the demodulated signal. I chose 4 kHz because examining the waterfall of the received signal, that seemed to encompass the entire transmitted audio. The average received signal strength was -90.9 dBm. This is about an S6. The average received signal strength was -77.0 dBm. This is about an S8 signal. The average received signal strength was -73.4 dBm. This is almost exactly an “official” S9 signal. The playlists for the three transmissions included several of the same songs, so I recorded the same song for these comparisons, to be as fair as possible. Listen for yourself to decide what the differences are. It’s also interesting to compare the received signal levels to theory. A 10 dB increase in the received signal level is expected for a 10x increase in transmitter power. In the case of the 1.1 watt Corsette and 14 watt Grenade, we have a power ratio of 14 / 1.1 = 12.7, which is 11 dB. So we expect an 11 dB difference in received signal strength. We actually had a 90.9 – 77.0 = 13.9 dB. In the case of the Grenade vs Commando, we had a power ratio of 25 / 14 = 1.79, or 2.5 dB. We had a received power difference of 77.0 – 73.4 = 3.6 dB, very close. Comparing the Commando and Corsette, we had a power ratio of 25 / 1.1 = 22.7, or 13.6 dB. We had a received power difference of 90.9 – 73.4 = 17.5 dB. I went back and measured the background noise levels during each transmission, on an adjacent (unoccupied) frequency, with the same 4 kHz bandwidth. During the Corsette transmission it was -98.1 dBm. During the Grenade transmission, it was -97.8 dBm. And during the Commando transmission, it was -95.9 dBm. So it seems the background noise levels went up as time went on, possibly due to changes (for the better) in propagation. This might explain why the measured power differences were larger than we expected from theory – propagation was getting better. Still, it’s nice to see how close our results are to theory. Ignore the box drawn around the 1700z prediction, that was the time today that I ran the software. You can see that for the 1 watt case, it predicts S5, for 14 watts between S6 and S7, and for 25 watts about S7. Numbers lower but in line with what I experienced. Note that my setup uses a 635 ft sky loop antenna, which likely produces stronger received signals than estimated. You also see that the signal strength curves upwards as time goes on, showing an increasing signal. This is also what I experienced with the increasing background noise levels, and suspected increase in received signal from Channel Z from the first to last transmission. As it got later, the signal increased. This is something I have experienced with NVIS – the signal improves, until the band suddenly closes, and the signal level suddenly drops. My thanks to Channel Z for running these tests on three of his transmitters, I believe the results are very interesting, and shed some light on how well signals with different transmitter power levels get out, under the same conditions. 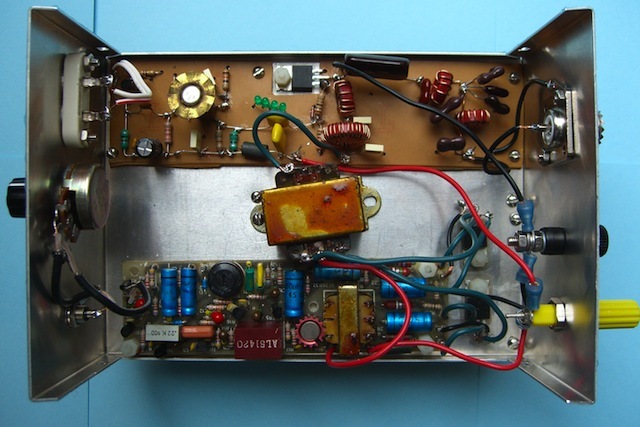 While shortwave radio is commonly thought of as being used for long distance communications, it also functions for local and medium distance links. This is accomplished by a method known as NVIS, or Near Vertical Incident Sky Wave, and is in fact what most US pirate operators are using, even if they have never heard of it before. I touched on NVIS in my previous post Going Long, which readers may wish to read before continuing. To summarize, the ability of HF radio waves to get from the transmitter to target location depends on the ionosphere being able to refract (or reflect) them back to the Earth. The stronger the ionization level, the higher the frequency that can be refracted back, as most radio enthusiasts know. This is why during periods of high solar activity, the higher bands (up to 30 MHz and even beyond) are useful for long distance communications during much or even all of the day. Whereas when solar activity is low (as it has been until recently) the higher frequencies are often dead, and lower frequencies must be used. But there’s a second factor as well – the angle that the radio waves strike the ionosphere. For a given ionization level, the lowest maximum frequency that can be reflected occurs when the radio waves are directed straight up. In this case, they would be reflected right down, for local reception. As the radio waves strike the ionosphere at more shallow angles (as would be the case for waves that are going to reach the Earth further away), higher frequencies will be reflected. In the above picture, paths A and B are at shallow enough angles that the radio waves get reflected back to the Earth. For path C, the angle is too steep, and the radio waves are not reflected, but pass into space. During the daytime, it lately has been reaching 10 or 12 MHz over the USA. 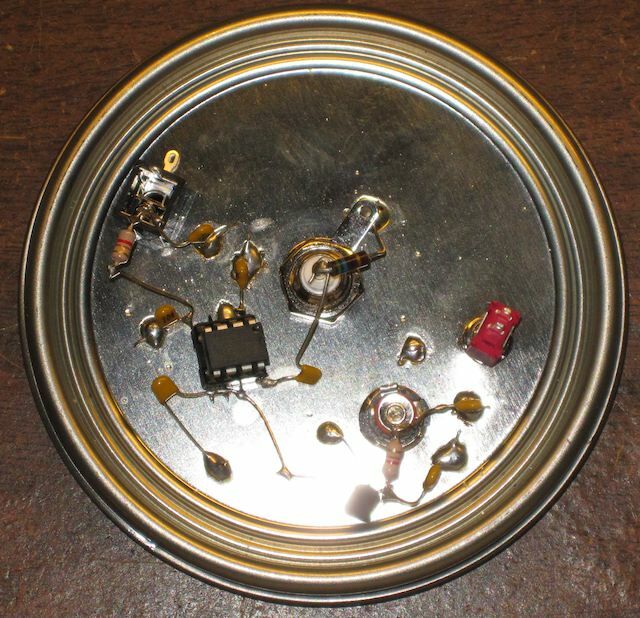 At night, it drops down to 3 or 4 MHz. MUF = foF2 * sqrt( 1+ [D/(2*hmF2)]^2) where D is the distance in km. Once foF2 drops below your operating frequency, radio waves directed straight up keep going into space. Waves at more shallow angles (reaching the earth some distance away) could still be reflected, depending on the geometry. This creates what is referred to as the skip zone, the distance around the transmitter where the signal cannot be received. As I type this at 0030Z on December 15, 2011, foF2 has dropped to 5 MHz over the northeast US. 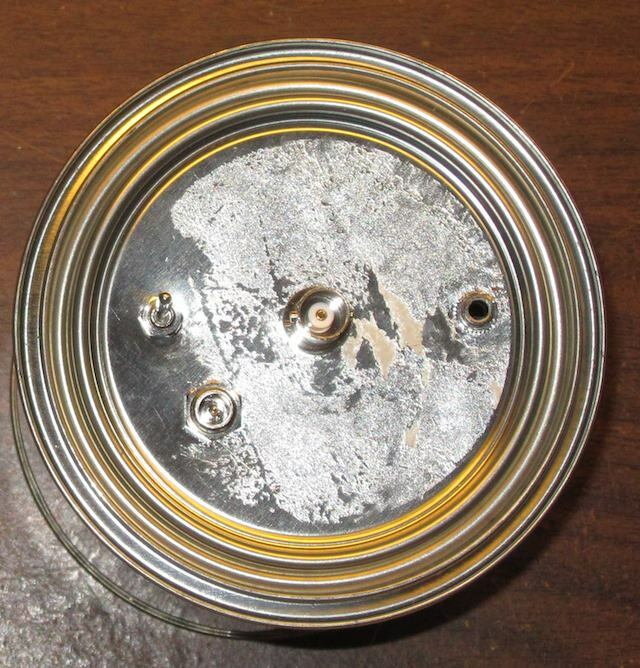 This leaves an approximately 350 mile diameter skip zone around the transmitter, where the broadcast cannot be received. The graph on the left is the pattern around the points of the compass, and the one on the right is the elevation. As you can see from the graph on the right, most of the RF energy is going up. This is bad for long distance DX, but good for NVIS operation. The key point to remember is that when the band closes for NVIS, you will lose your local audience, where local could mean a radius of several hundred miles around your station. Dropping to a lower frequency (like 5, or even 3 MHz which operators have used in the past) regains your local audience. There’s a reason WBCQ uses 5110 kHz. Absorption losses increase as you go down in frequency, however, roughly inversely to the square of the frequency. So the absorption losses at 3 MHz are four times that at 6 MHz, and about 5.4 times that at 7 MHz. Operating earlier in the evening, before the band closes for NVIS, is another solution. representation to another via a precise nonlinear transformation. The toggle switch isn’t being used. I was going to power the meter off of a 9 volt battery to further reduce noise, but comparison tests between the battery and DC power supply showed no difference. corresponding to a sine amplitude of 20 μV. 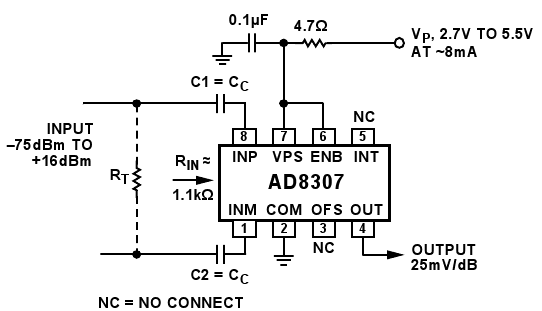 There is a noise floor, and the specified range of the AD8307 is −74 dBm to +16 dBm. The output voltage increases by 25 mV for each dBm increase in RF input. Have you ever wondered why other listeners are hearing a pirate with a very strong signal, while you can’t hear it at all? Or have you been listening to a station with a solid SIO of 555, only to have it fade to nothing, while others on IRC are still reporting solid copy? Chances are, the station was operating in NVIS (Near Vertical Incident Sky Wave) mode, where the radio signals go straight up from the transmitter, and down to the receiving site. 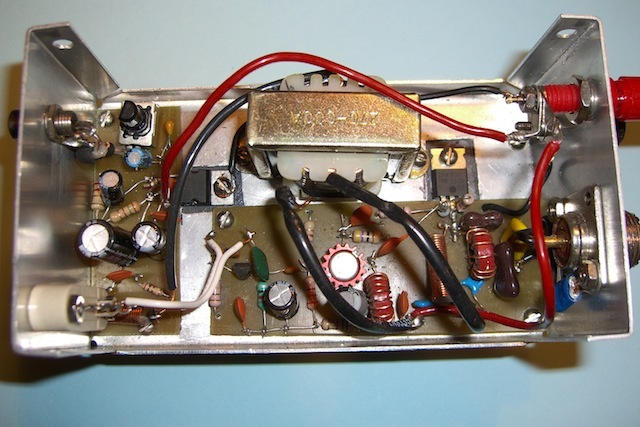 NVIS is the mode used for all short distance communications on HF. Think of it as the opposite of “skip”. During the daytime, the ionosphere is able to support propagation of higher frequencies. As the sun sets and the ionization levels start to decrease, the maximum frequency begins to drop. 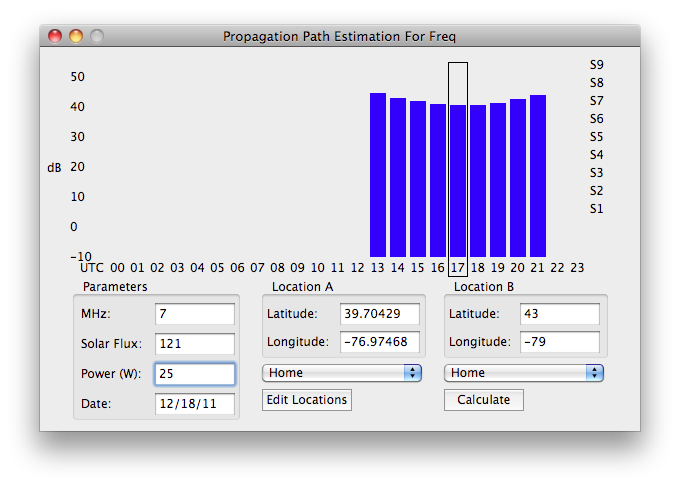 For a given frequency, shorter transmission path distances will be affected first. The path will “close” very suddenly, sometimes over the span of just a few minutes or even seconds. The signal strength is shown in dBm. Refer to the previous entry How many watts do you need? for a refresher course in dBm. In general, an S9 signal is -73 dBm, every S unit is theoretically 6 dB, so S8 is -81 dBm, etc. You can see that the signal was varying between -60 and -70 dBm, so about S9+10 dB. Then quite suddenly, it dropped to about -85 dBm, and then continued to decline to about -90 dBm. 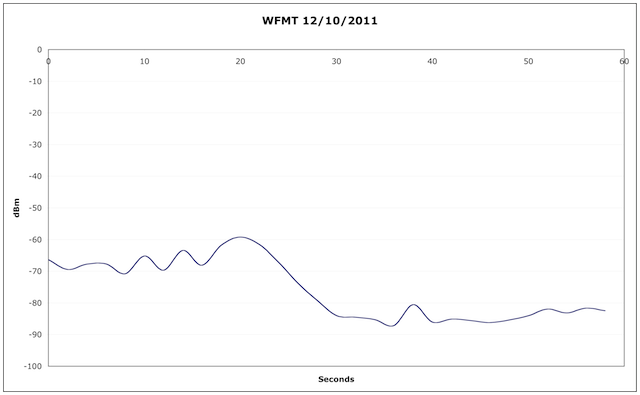 Here is a closeup graph showing one minute of signal strength during the time WFMT went long. You can see that it went long between 20 and 30 seconds. That is, it only took 10 seconds. 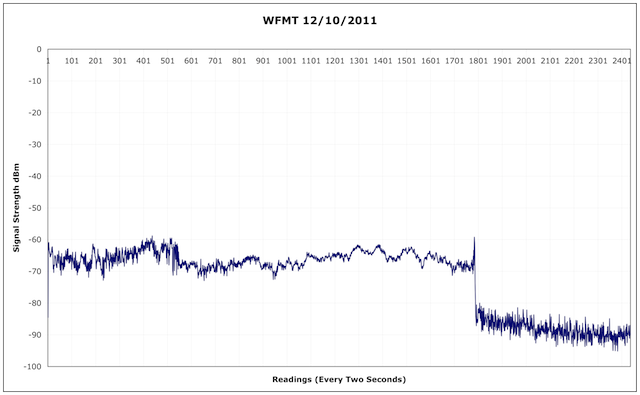 Looking carefully, you’ll also observe an increase in signal level just before WFMT went long. I have noticed this many times. My theory is that propagation is best when the incident angle of the radio waves to the ionosphere is very close to the critical angle. In this case, the incident angle is of course fixed, but the critical angle is changing as the ionosphere weakens to nighttime levels. Note that even though the critical angle was exceeded, some radio waves are still being reflected, as the signal level has not dropped to zero yet (although it does continue to trend down, at some point the station will completely fade out). The critical angle determines the maximum frequency that can be propagated between two points. Remember from above that the maximum frequency that can be propagated is equal to foF2 divided by the sine of the angle. We can use some simple math to calculate what frequencies will work, knowing foF2. Note that like foF2, hmF2 is continuously varying. At 1600 UTC on December 14, 2011, the foF2 is about 9 MHz over the eastern USA, and the mmF2 is about 240 km. So 43 meters is potentially open to anywhere on the east coast, even using NVIS. Of course this only takes the MUF into account, there is also the LUF, or Lowest Usable Frequency, which is mostly a function of transmitter power and D layer absorption. At night, foF2 dramatically drops. Lately it has been going below 7 MHz in around 2300 UTC, turning off NVIS for 43 meter band transmissions. With an foF2 of 6 MHz (observed today at 2330z) the MUF is around 7 MHz for a distance of 200 miles. For this reason, operators who want to reach their target area (east coast ops reaching east coast listeners) should consider using lower frequencies at nighttime. Years ago, the 3 MHz band was somewhat popular for pirate operations. 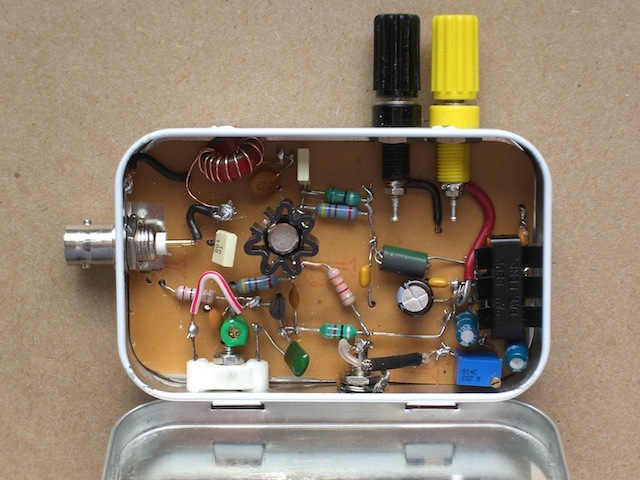 Even somewhere in 5 MHz would be useful. NVIS itself is worthy of an entry by itself, which is coming up next. 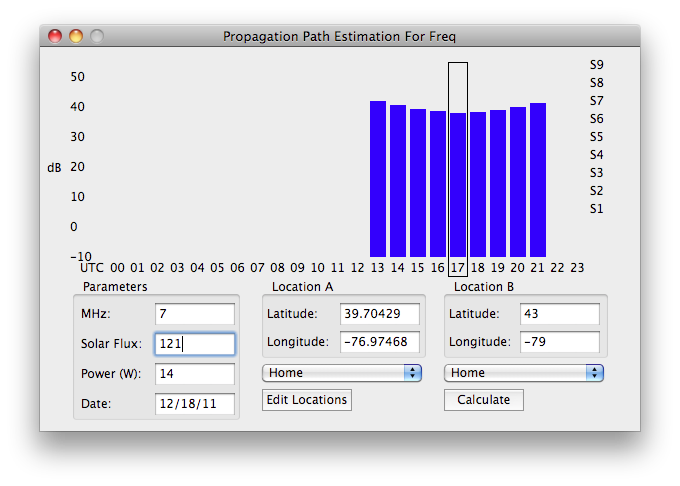 If you’re interested in getting real time propagation information, take a look at DX ToolBox which is available for both Windows and Mac OS X.